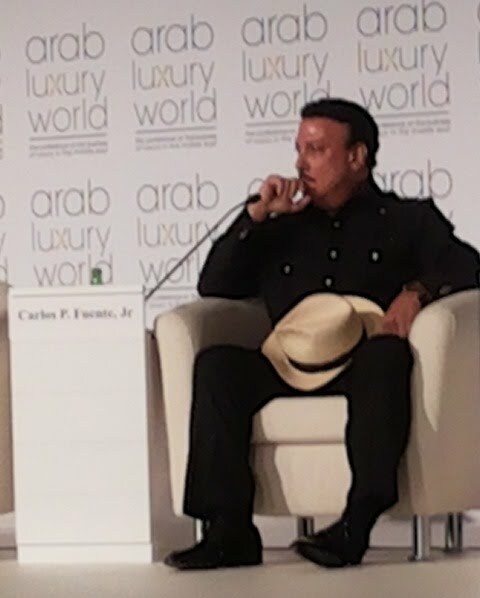 Arab Luxury World Conference, 02.06.2015, The Westin Dubai, Mina Seyahi. 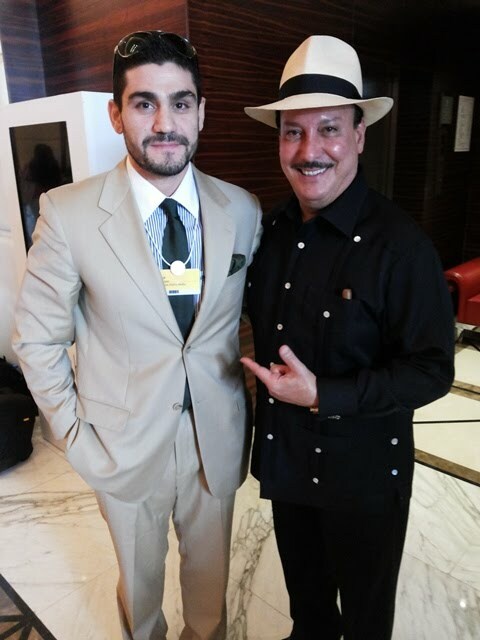 I met with Mr. Carlos Fuente Jr., president of Arturo Fuente cigars at the Arab Luxury World Conference. He had just been on the panel for the discussion ‘The Art of Story Telling’. Carlito as he is known, told me that his journey to the conference had started a day and a half back in the Dominican Republic and took him over Miami, London and finally arriving in Dubai earlier that morning. Despite the long journey he had no sign of jet-lag and most graciously accepted my interview request. For me his energy and positive attitude portrayed a man who is passionate about what he is doing and perhaps reflects the corporate culture over at Arturo Fuente. AS: Carlos Fuente Jr., if I can ask you about Arturo Fuente and the story behind this world famous brand, this family company, tell me about the value of the brand and the history behind it. Arturo Fuente is a story of a family and a brand that began in 1906 my grandfather at the age of 15 came on a ferry from Havana to Florida right after the Spanish – American war, the family were tobacco growers and were struggling after the revolution. He came at a very young age to save some money and send it back home, he was making cigars for a couple of years and caught that dream! that dream of opportunity to raise a family and have his own business one day and raise that family with education and health and so forth. He established Arturo Fuente cigars in 1912. Today we are the oldest Cuban hand-made cigar family business in the world, fully family owned and family run. I’m the fourth generation and the fifth generation is already in the business. Our lives have been through ups and downs and turmoil and full of constant struggles, off course being in Florida we went through the great depression and the two world wars, things up, things down, you know how it is. Our first big catastrophe was the fire in 1924 which destroyed my grandfather’s company. It took us many years to re-build again but we always survived as a family. But off course the biggest struggle came when the United States placed an economic embargo on Cuba. All our tobacco was 100% Cuban, my grandfather farms in Cuba, he used to go back and forth to make Cigars for the US market. It was a time when there were many many factories in our community, well around 200 factories and most of the big corporations that controlled the industry were unsure about the future and their children were not interested in the business, since they lost the source and they weren’t able to rebuild eventually they got out of the business. My family stuck together, we moved to Nicaragua they had the finest soil, near the Caribbean where we could place our Cuban tobacco. We went to Nicaragua and started a factory. In 1978 there was another revolution the Sandinista Revolution in Nicaragua and our factory was destroyed again. We went to Honduras, another fire but this time an electrical short circuit, it was only 6 months since we were there. So we tried again in Florida to teach cigar makers and rebuild our business but it was a time when the young generation was not interested in making cigars. Then an opportunity came, we always wanted to go Dominican Republic from the beginning but there was a dictator there, Turujillo in Santa Domingo and there wasn’t any infrastructure. My father went to research and as is the island right next to Cuba, it has volcanic soil, so we went to Santo Domingo to the Dominican Republic in 1980 and we’ve been there 35 years, our company was one of the first to bring the Cuban culture in cigar making to Santa Domingo. It’s certainly been an incredible journey since. From being basically unknown we have become one of the most famous brands in the world. AS: What made you come to Dubai and decide to invest and grow your presence in the region? Fortunately for me and my relationship with Hublot (the Swiss watch maker) I was invited to come to Dubai last year, we did not have a market here in Dubai because cigars were so over sold in our traditional markets and very few were able to ship over to here. After coming over to Dubai with Hublot and meeting so many people and making good friends I decided to come again, this is my second visit to Dubai I’ll b back again in December. We are really focusing in the area and want to develop this market which won’t only be good for the business but I personally feel happy here with the people with the embrace and the cigar connoisseurs. Dubai is the gateway of Luxury and people appreciate the finer things and they are very educated and affluent and really for Cigars all these are home-runs, I’m spending a lot of time here in Dubai. AS: We are very happy to have you here Mr. Carlos. CF: Oh thank you very much, glad to be here as always. AS: If we were to get a little political, the recent developments between the United States and Cuba under Raul Castro’s new found warm relationship with President Obama potentially look to be heading towards fully restored ties both political and commercial between the two nations, how will this affect the price of Cigars and your Brand for that matter? CF: No one really knows but it’s very complex. I was born in a country of democracy, freedom and believe that freedom is non-negotiable and it’s very hard for me to justify supporting a system when a cigar maker in Cuba makes 12$ a month, as a Tourist if you go to the factories the same cigar will cost you 20$ it’s not shared by the person who makes the cigar, it’s social injustice. As far as what happens with Cigars, if there is a change in the horizon which is my ultimate goal there is a change through this relationship there is a change for the better and for the people there will be social justice. I believe that Cuba has educated all the population and Cubans have a very high level of education, every cigar maker I mean. I also think it’s very difficult for cigar makers to know that he has a cousin living in Miami washing cars and making 500$ a week. I think Cigar prices are going to go through the roof and I think there will be a shortage in supply. My main hope is for the best for the people of Cuba. AS: How about the brand and the direct competition from Cuba? I just want to say that through the 103 years of our family business there have been obstacles, there have been high times and low times and certainly struggles, I’m looking forward to the day when Cuban cigars will be available in every country and that I will be able to have my cigars next to Cuban Cigars, it’s my heritage and its where my books and teaching came from, it’s where my grandfathers from both sides came from. I am also looking forward to the day when we are all able to compete and share the world of fine cigars together through the same level playing field. The consumer will be the winner and we will all win. There will be many opportunities for everybody. AS: Well, thank you very much indeed, Carlos Fuente Jr., president of Arturo Fuente cigars, from very humble beginnings to a truly established brand, as a cigar smoker myself I wish nothing but the best with all your endeavors. CF: Thank you very much and looking forward to enjoying a cigar with you shortly.